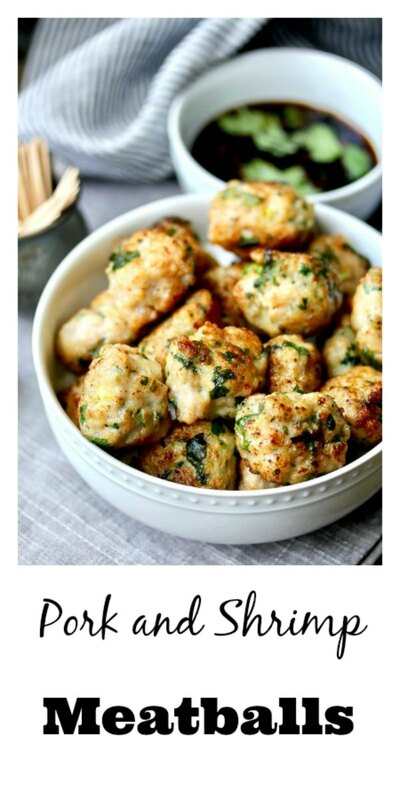 These pork and shrimp meatballs are an easy cocktail party appetizer. They are a snap to make and loaded with flavor. To make these pork and shrimp meatballs, you combine pork shoulder and shrimp in a food processor. Once you process the proteins, you add some scallions, cilantro, white pepper, and some fish sauce to the mixture. The meat, because it is ground in a food processor, develops a sticky protein called myosin which holds the meatballs together without any added egg or breading (Fun fact if you are ever on Jeopardy... ). I served this with a soy, vinegar, and garlic dipping sauce, but you can set out a choice of sauces, such as a spicy barbecue sauce, gochujang sauce, and/or some katsu sauce. Actually, these are so tasty they don't even need a sauce. This recipe has been slightly adapted from the book Mark Bittman's Kitchen Matrix: More than 700 Simple Recipes and Techniques to Mix and Match for Endless Possibilities. Over 700 recipes in 300 pages! This recipe came from the section "The Stress-Free Dinner Party." It's a mini section featuring "48 recipes from drinks to desserts" in just 4 pages. 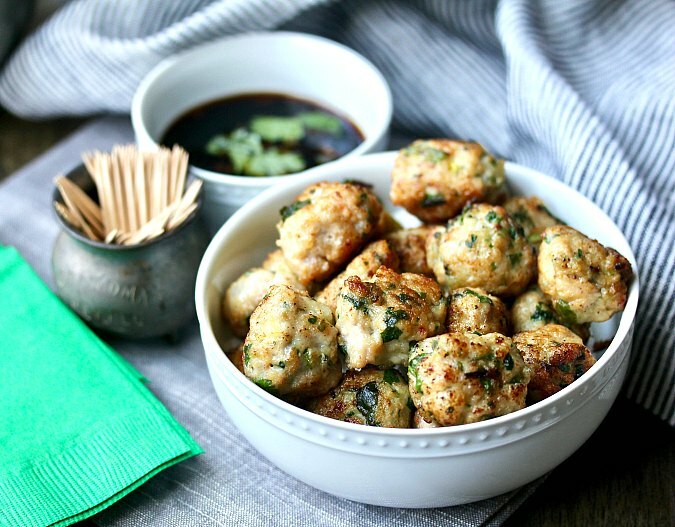 The meatball choices include parmesan, chicken tikka masala, spicy cumin, and these pork and shrimp meatballs. I'm spending a year cooking through sections of the book with Wendy of A Day in the Life on The Farm and Camilla of Culinary Adventures with Camilla. After the recipe, be sure to check out Wendy's and Camilla's meatball appetizers. Add the pork and shrimp to the bowl of a food processor and pulse until chopped. Add the scallions, cilantro, fish sauce, and pepper, and pulse until ground and form the meat mixture into 1 inch balls. Heat about 1/4 cup of neutral oil in a 12 inch skillet, and fry the meatballs, turning regularly, until browned and the meatballs reach an internal temperature of about 165 degrees F.
Serve with toothpicks and the sauce of your choice. These sound amazing. 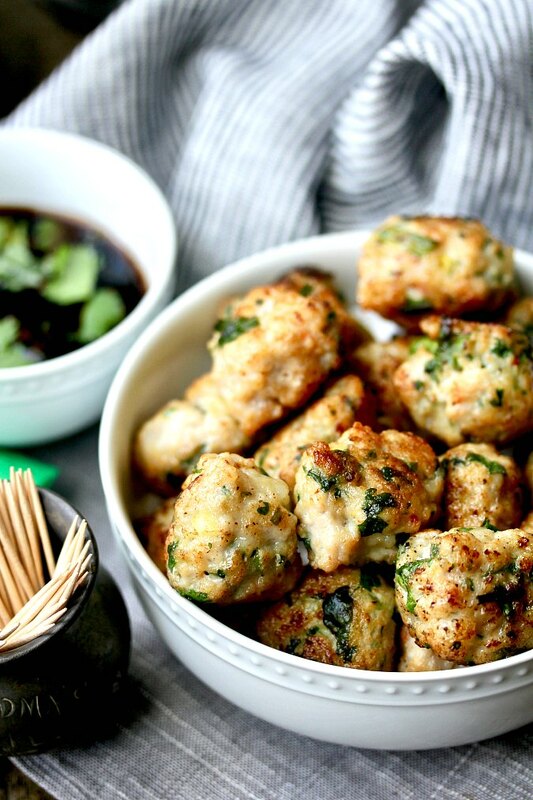 I have made shrimp balls before but adding pork to them is a great idea. I've had them together in pot stickers (coming soon to Fish Fridays) and they are delicious together. Fantastic work Karen! We never combined these two in meatballs and it sounds like a great idea! After all, we had pork&shrimp with fried rice in East Asian-style dishes and they do taste great together! Kudos, pinned! It's a great Asian combination. They are delicious together!